An additional storey has been built on top of the north part of the house to increase the floor area. 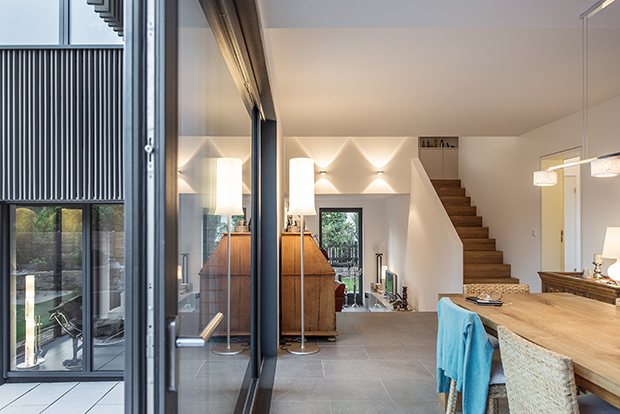 In combination with an extension at ground level the house now provides more space for the family and their guests. 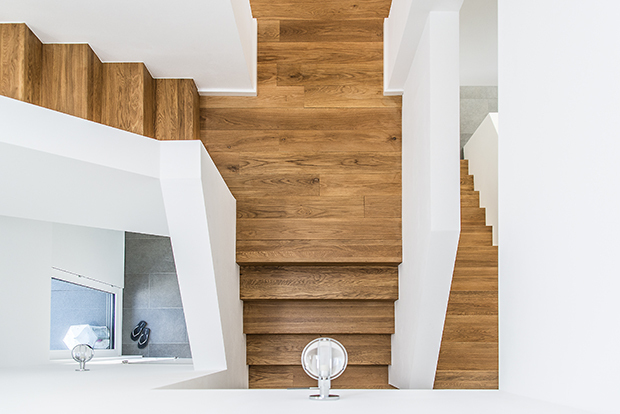 The former 70ies character has been developed further with the result of an internal triple height staircase and a view diagonally through the house by continuing the split level idea up to the additional 2nd floor. The internal open space serves as communication zone while theAi? ?private/intimate spaces like bed- and bathrooms are clearly separated. The shape of the existing building has been respected and transformed into a contemporary form with a folded roof structure. The former wooden rain screen covering the 1st and 2nd floor has been kept as the concept and transformed into a new design of a fully insulated wall with a black waterproofed background layer and a front layer via thin vertical timber stripes on an irregular grid. The Facade has been developed by KHBT as well as produced and installed. This has been achieved through a thorough process of design including the various manufacturers as well as creating mock ups. The timber fins have been coated with a newly developed mineral based paint by the company Keim.